The easiest meal ever consists of juicy and perfectly seasoned chicken breasts served with batata harra, baked Lebanese spicy potatoes that melt in your mouth while enticing your tastebuds. I’m going to start this post by being completely honest with you. While the chicken in this recipe is delicious, the real star here is the batata harra (or the Lebanese potatoes, if you’d prefer). Maybe it’s because I’m going through a major carb phase, but I was utterly obsessed with them! As in, I gave my husband two or three and devoured the rest of the potatoes by myself. They were a little caramelized from the hot oven, but were soft as pillows inside. And the combination of garlic, olive oil, cayenne pepper, lemon juice and parsley really hit the spot! Oh, I could live off delicious potatoes forever. I don’t know why, but lemon and parsley taste like spring to me, so I like to call this dish a way to spice up spring. Now, maybe spicy is not your thing, so it is totally okay to adjust the amount of cayenne or just omit it altogether! If cayenne is not on hand, chili powder will do the trick. You might feel a little frustrated to discover that even though this recipe is called “Sheet Pan Chicken”, you’ll need more than a sheet pan to make it. Sorry! ? The thing is, you simply must brown the chicken breasts in a skillet before adding them to the sheet pan for maximum flavor. I know nothing beats tossing ingredients in a sheet pan and coming back 30 minutes later to a meal that cooked itself, but – at the same time – nobody likes boring, white chicken. It NEEDS some color! Trust me on that one. I was also tempted to marinate the chicken before browning and roasting. But I decided against it, cause I want this dish to be something you can put together when you completely forgot about dinner and your family is starving. So while I do think chicken breasts always benefit com a lemon juice/olive oil marinade, you have my one time permission to just get them out of the package, season with salt and pepper and go to town! If you’re a Lebanese cuisine lover like me, you probably know that Batata Harra is usually served fried. Crispy cubes of golden potatoes that work both as an appetizer and a side dish. However, I am trying to avoid fried food and aiming for a healthier way of living. Not to mention, I was definitely not in the mood to deal with a pan of hot oil. So this lightened up, easier version was born! I hope it makes it to your table and that you and your family enjoys it as much as we did! Because good food does not need to be complicated! ? P.S. Connect with the US Potato Board on Facebook, Pinterest, and Instagram.
) Preheat oven to 500F degrees with a baking sheet inside.
) When oven is hot, remove baking sheet and spray with cooking spray. Spread the baby potatoes into one layer and roast for 10 minutes.
) While potatoes are roasting, mix the olive oil, minced garlic, salt and pepper, cayenne pepper, parsley and lemon juice in a medium sized bowl. Reserve.
) Season chicken breasts with salt and pepper. In a large skillet, over medium high heat, heat the olive oil and brown the chicken breasts on both sides, about 4-5 minutes per side.
) 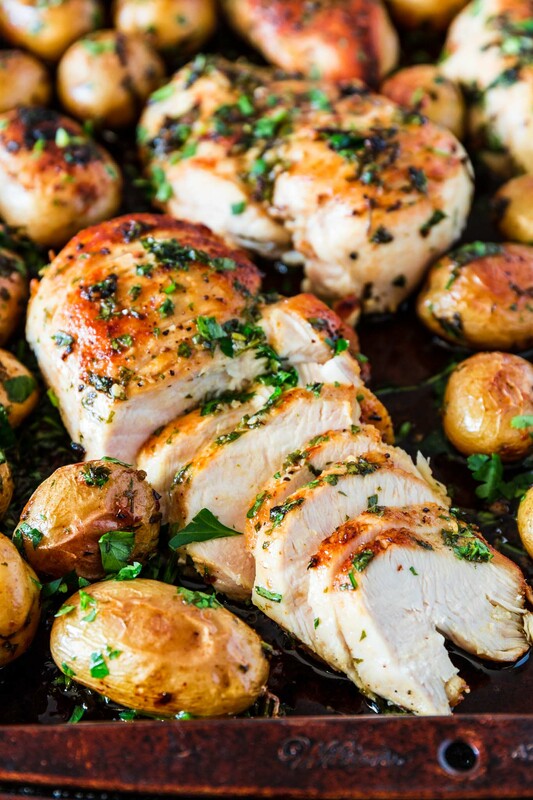 Once potatoes are done roasting for 10 minutes, add the chicken breasts to the baking sheet and pour the marinade into the chicken and potatoes, tossing so everything is nicely coated. 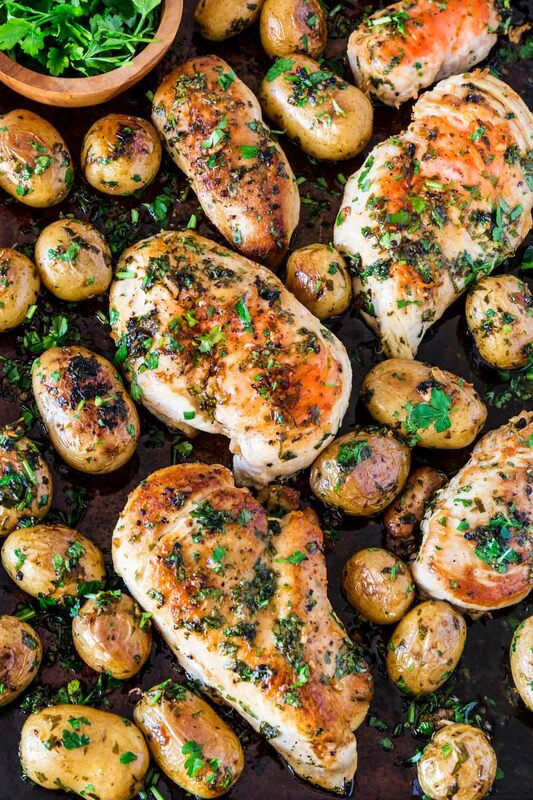 Return the baking sheet to the oven and roast for another 10-15 minutes or until chicken is cooked through (165F degrees) and potatoes are tender.
) Sprinkle with fresh parsley and serve.